During daylight the fluorescent material can be seen from considerable distances, and during darkness any light will be immediately reflected from the reflective stripes on both sides. 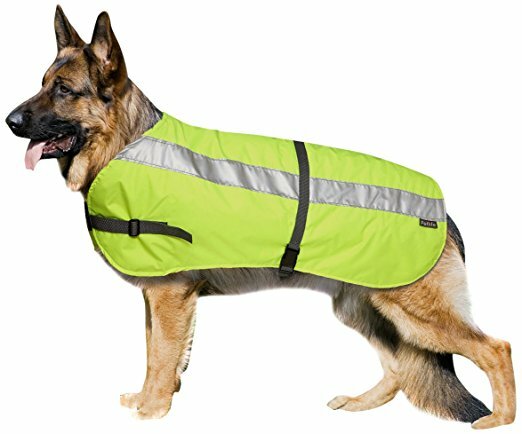 Incorporated between the inner and outer layers of the Flcta Hi-Vis Dog Jacket is a layer of Flectalon thermal insulation developed from NASA research into aluminised surfaces. Flectalon can reflect up to 95% of radiated heat . Water resistant and lightweight. Machine washable. Made in the UK. 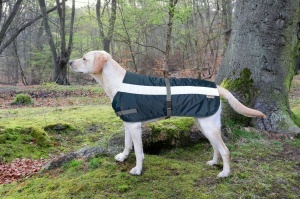 To ensure a comfortable fit for your dog we recommend measuring your dog from the base of the tail to the collar position.